1. 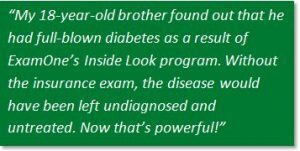 Diabetes can impact almost anyone. Today, more than 30 million Americans have diabetes, with 7.2 million still undiagnosed. Additionally, the Centers for Disease Control (CDC) estimates there are 84.1 million people with pre-diabetes and 1.5 million are diagnosed every year. 2. Are you at risk? Take the American Diabetes Association (ADA) Risk Test. 3. A1c is the gold standard of diabetes testing. In 2016, ExamOne became the first company in the life insurance industry to update insurance profiles to include A1c testing on all applicants. Find out why it’s preferred testing method for life insurance testing. 4. Know your health. As part of the life insurance process, applicants can view their laboratory results securely online at MyExamOne.com within two weeks of their exam. Knowing these results helps increase awareness of their current health status and empowers applicants to lead a healthier lifestyle if needed. 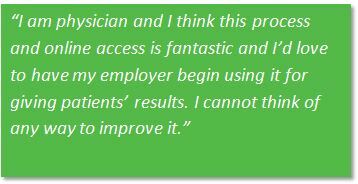 Learn more about online laboratory results at ExamOne.com. 5. Stay active. According to the American Diabetes Association, the economic burden of diabetes and prediabetes in the United States is over $327 billion in medical costs and lost productivity each year. However, 150 minutes of exercise each week can help reduce your risk for type 2 diabetes. See how some of our employees stay motivated to keep active. For more information on how the American Diabetes Association is working to prevent and cure diabetes and to improve the lives of all people affected by diabetes, visit diabetes.org. Today, more than 30 million Americans have diabetes, with 7.2 million still undiagnosed. Additionally, the Centers for Disease Control (CDC) estimates there are 84.1 million people with pre-diabetes. Each November, during Diabetes Awareness Month, we are reminded to focus on the growing crisis and share knowledge about diabetes and its impact on millions of Americans. The CDC and the American Diabetes Association (ADA) are working to reverse the diabetes epidemic in America. As a leader in the life insurance industry, ExamOne has been contributing to that cause since 2016, when it became the first company in the industry to update insurance profiles to include A1c testing on all applicants. Based on this testing we have found that 73.5% of pre-diabetics (A1c 5.7-6.4) and 17.8% of presumptive diabetics (A1c 6.5+) pass unreported to underwriting. For those who are diabetic or pre-diabetic, maintaining a healthy, active lifestyle is critical in managing the disease. Stay active ­– A simple 20- to 30- minute walk each day can help spur weight loss and improve Body Mass Index (BMI). In individuals with type 2 diabetes or pre-diabetes, maintaining a healthy weight can help lower insulin resistance. Eat well – Managing diabetes doesn’t mean you have to sacrifice tasty foods. Check out some of these fun, healthy recipes from the ADA. Know your health – Although many Americans do not receive regular health check-ups with their primary care physician, it’s important to know current health status to stay ahead of diseases like diabetes. Known diabetics should have regular check-ups and monitor their blood glucose daily. As part of the life insurance process, applicants can view their laboratory results securely online at MyExamOne.com within two weeks of their exam. Knowing these results helps increase awareness of their current health status and empowers applicants to lead a healthier lifestyle if needed. Learn more about ExamOne’s Inside Look® online laboratory results at ExamOne.com. Is Pre-Diabetes or Diabetes Increasing the Mortality Risk of your Population?